The Loft at Russell’s is pleased to welcome DeLille Cellars on Saturday, February 11th, at 7pm. Enjoy a night with Owner Greg Lill and Chef Russell Lowell at the first Winemaker Dinner of the New Year. 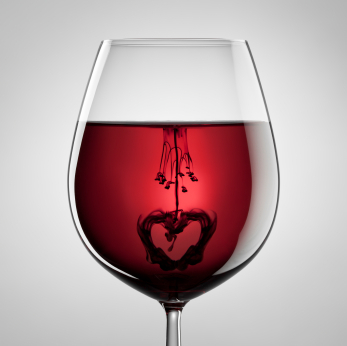 This pre-Valentine’s Day celebration will pair a wonderful meal with DeLille’s handcrafted, old-world style wine. Dinner is $100 per person, not including tax and gratuity.Please call (425) 486-4072 for reservations. Click here to see the menu. Bring your sweetheart to the winery Sat., Feb. 11 or Sun., Feb. 12 and take in an artisan jewelry show while enjoying a complimentary Boehms chocolate with your wine tasting. Our own tasting room manager, Diane Lacroix, will be showing “Charms, Chains & Crystals,” her unique collection of one-of-a-kind necklaces, earrings and bracelets. Saturday only, Healing Heart Gems will be on hand to share handcrafted jewelry made from semi-precious stones and crystals. And gals, if he treats you well, return the favor with a box of Boehms chocolates, available for purchase all weekend from 11 a.m. – 5p.m. Join us and Intrigue Chocolates for our annual Valentine’s Weekend, Wine and Chocolate event. The wines we will be pouring will be paired with Intrigue Chocolates’ scrumptious truffles. Join Apex at Alder Ridge and renowned local Chef, Ryan Sturm, on February 11 for a unique food and wine pairing experience. In honor of Valentine’s Day we will perfectly pair our award-winning Apex and Apex at Alder Ridge wines with a menu infused entirely with chocolate. There will be six courses of heavy appetizers for you to enjoy. That’s right, just like our one of a kind Chocolate Shop, we will prove that anything infused with chocolate can be a huge hit. Chef Ryan Sturm, former chef of Alligator Soul, a longtime Everett restaurant institution known for Cajun/Creole cuisine. Chef Ryan was personally trained in New Orleans under such famous New Orleans Chefs as Emeril Lagasse (Emeril’s New Orleans) and Jamie Shannon (The Brennan family’s Commanders Palace). May Palmer, The Queen of Ivory Soul will thrill with her silky, chanteuse style. Grab your date and don’t miss this one-of-a-kind event! Please RSVP by calling 425.408.1796 or by emailing info@apex-at-alderridge.com. Tickets will go quickly; this event is expected to sell out. Get your tickets today! Pairing red wine and chocolate can be a challenge: Chocolate that is too sweet or two bitter makes the wine taste BAD! We’ll be testing artisan chocolates with William Church wines (someone has to do it!) and select those match ups that really make both the chocolate and the wine taste delicious. Join us! $5/person helps us get the highest quality chocolates. Join Airfield Estates for a Cabtastic tasting event! Get a sneak peek at our upcoming Reserve Cabernet Sauvignon, sample a variety of our other Cabs & Cab based blends, enjoy delicious chocolate treats, and receive a rose with any four bottle purchase (while supplies last). The Wine Cellars of Washington is hosting their first annual Valentine’s Day Celebration on February 11th & 12th. There will be live music starting at 2pm on both days along with complimentary gourmet chocolate samples, wine pairings with wine bites, gourmet caramel samples, unique dip & balsamic tastings. Each winery will also be offering a special which may include complimentary tastings and/or discounts on wine. Finally, you can enter to win gift baskets filled with products from individual wineries and market vendors. We’re celebrating twice here at Syncline! Join us February 11th and 12th for a special weekend celebrating one of our favorite holidays, Valentine’s Day. We’ll be offering a dizzying array of gourmet chocolates. Which would your sweetheart prefer? A gift of gorgeous locally made chocolates or maybe something exotic from South America, Africa or Europe? We have both. Make a date of it! Also come see us and taste our exciting new releases. The fun and easy drinking 2010 Carignan-Grenache and the rich and spicy 2010 Horse Heaven Hills Mourvèdre. Join us for our I hate Valentines Day event! We will be playing movies, like How to Lose a Guy in Ten Days and 27 Dresses. Happy hour is all day long ($4 wine by the glass). We will also have all kinds of treats to indulge yourself in. Come in RED shoes to receive a special promotional package: $25 for a bottle of Girly Girl Merlot paired with a RED shoe wine stopper. Run in with your RED shoes as supplies are Limited! If you haven’t yet tried Intrigue’s truffles, you don’t know what you’re missing. If you have, we’ll see you at the winery! For those of you who didn’t get enough wine and chocolate at our weekend event, or on Valentine’s Day, stop by the warehouse wineries for one last chance at decadence. Intrigue Chocolates will be in the winery with samples of their truffles. As always, the wine walk is from 4:00 – 8:00 (ticket tent closes at 7:00pm). Park your car and walk to all the participating wineries. For a flat price of $20, you get 15 tasting tickets to be used at any of the wineries. For more information or to purchase tickets in advance, visit Woodinville Warehouse Wineries.